Looking for unfurnished offices to rent? Despite the increasing popularity of serviced and shared office space, a conventional leased space remains the most popular office space option. It’s also generally the cheapest way to rent commercial property. Traditional leased spaces are a particularly viable option if you’re looking for low-cost offices to rent that you’ll have a lot of control over. We’ve got a UK-wide database of rental properties here on Office Genie, before you search away why not read on and learn a little more? Rented office space before? Why use Office Genie? If you’ve leased space before then you probably know how the process works well enough. So, why should you use Office Genie to find your next office space? For a start we’ve got extensive lists of traditional leased property that you can search quickly and easily. We also list shared and serviced offices. Both of these can be handy options while you’re searching for a new property. They can make for an excellent temporary home if you want somewhere for a short time until you find your ideal permanent space. They’re also a handy option if, when you find your new office, you want to locate a team in a different place. Go open plan: You’ll generally have a bit more room to work with by doing so. Cut down meeting room space: After all some of the best business is done at the pub. Use smaller desks: Combine these with a clear-desk policy and you may find they don’t feel any smaller at all. Home working: Encourage some staff to work from home on occasions, or even house a team in a shared or serviced office nearby. Either way, you can save space by avoiding having everyone in the office at once. You could also look into renting a space that’s larger than you require and sublet any spare space by putting it up for rent on Office Genie. Doing so can really help towards your rent at the end of the month and it means you can get your hands on a bigger property with room to expand. Office rental costs are generally quoted in ‘price per square foot’ or ‘price per square metre’ (per year). So, to work out the annual cost you simply take the price and multiply it by area. Then divide it by 12 for the monthly cost. You can also divide it by your chosen area/person ration to calculate the cost per person if you want to compare it to shared and serviced office space, both of which you rent on a per-desk basis. 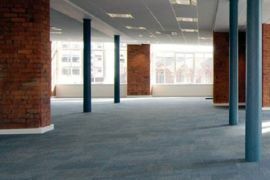 Renting office space can seem quite cheap on paper, particularly when compared to serviced and shared properties, but remember that there are other costs involved: legal fees and building management to name a couple. If you want a really cheap space it might be worth looking for an office that’s a little further away from prime locations; whether this be out of town or simply in a less desirable spot. In such places you might well find some cheaper properties. 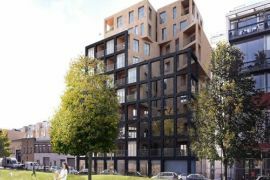 Instead of fashionable Soho, why not consider less-trendy Battersea, or even out of town somewhere such as Watford? These examples, as with many similar locations, are still extremely well connected so staff shouldn’t find it too difficult to get to work. In fact there might even be more parking available. If employees are finding the commute more expensive, you could always subsidise their travel with some of the money you may save. Legal advice: Even for small offices on a straightforward lease (if there is such a thing), the minimum fee you'll pay a solicitor to advise on the lease is about £500. Furniture and decoration: You'll generally be moving into a shell, so obviously you'll need to budget to kit the place out. Building management: You'll need to pay for business services (utilities, broadband, and so on), and also building insurance. Dilapidations: You'll generally be asked to put the building back exactly as you found it when the lease ends. Beware that this can be extremely costly! Sorting all of these issues will also add a considerable amount of admin to your workload. It’s often best to hire an office manager to deal with this if you can afford to. Contract lengths have shortened in recent years, but you'll still likely be asked for a commitment of at least three years for office rental. Make sure you're happy this fits in with your plan for growth. If you're just starting out and don't fancy the commitment or don't have clear plans, then consider more flexible shared or serviced offices as a short to medium term alternative. If you've not taken on a commercial lease before, be aware they are very different to residential equivalents. As a commercial tenant you usually have complete responsibility for maintaining the building – for example if the roof needs replacing then you'll need to pay to replace it. It's vital that you take legal advice before you sign a contract and continue to take advice and protect yourself as you manage and finally exit your tenancy. How does conventional space compare to serviced and shared options? What traditional rented office space gives you is greater control, and a greater ability to find something that particularly suits you. For example, if price is most important then you can probably save money by going for leased space (in return for a long-term commitment), or if décor is important then you get complete control over how your building looks and feels. 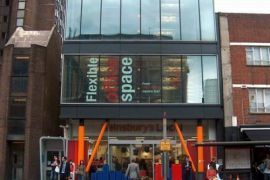 Serviced and shared offices work out a little more expensive, but the plus side is that you don't have all the hassles of managing a building and the space is a bit more flexible - you don't make a long-term commitment. 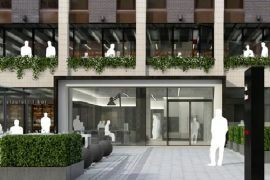 What next in your search to let office space? Enter the destination you’d like to search in the box at the top of the page (this can be a town, city, street name or postcode) and hunt away. You can also narrow down your search by adding the number of people you want to fit in your space or even the maximum price you’d like to pay per person. Remember, if you cast your net a little wider you might find some cheaper offices. Our ‘Radius’ option allows you to expand (or contract) the area in which you are searching. You can also use our main office space search to compare all types of space in your area on a per-desk cost basis.